The other day I was at the book store and came across a book my kiddos would love. 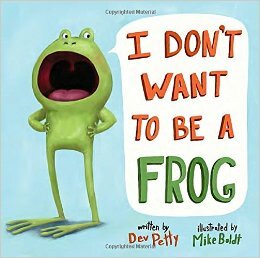 I Don't Want to Be a Frog by Dev Petty is a hilarious picture book that also teaches that being yourself is the best fit. The little frog decides that being a frog isn't great, and he decides to be others animals. The daddy frog tries to convince him that being a frog is better than he thinks. At the end the little frog is given the perfect reason to stay a frog.